LAHORE, Pakistan (Morning Star News) – Yaqub Masih is one of thousands of impoverished Christians facing demolition of his makeshift home in Islamabad after a government agency last week stated that informal slum settlements of Christian migrants threatened the city’s Muslim-majority demographic. 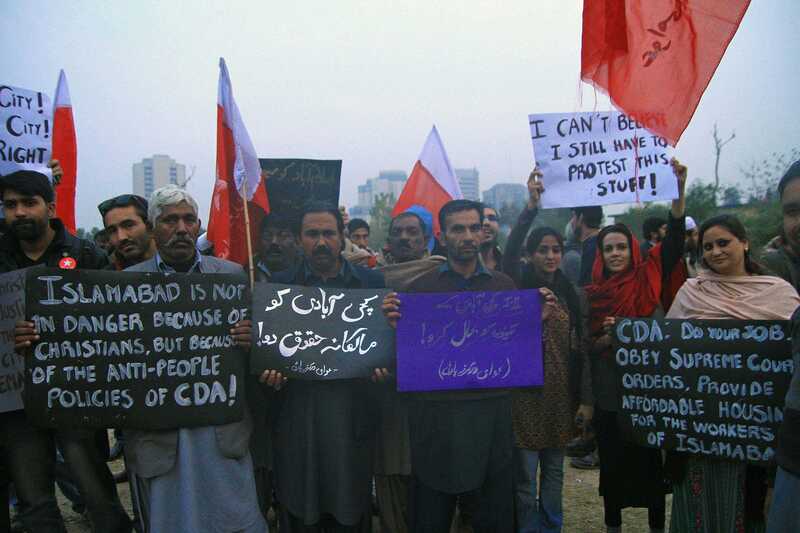 The CDA statement came in response to an Aug. 2 petition to the Supreme Court by the Islamabad-Rawalpindi Chapter of the Awami Workers’ Party (AWP) seeking a declaration that the government must provide shelter and other amenities to citizens under the constitution. The CDA on July 30 began evicting some of the more than 16,000 people in the I-11 slum settlement in Islamabad, Pakistan, bulldozing ramshackle homes and shops, before the Supreme Court issued a stay order stopping the operation in August. Not all of Islamabad’s slum dwellers are Christian, and initially the CDA had generated propaganda that the settlements housed Islamic terrorists as justification for the evictions, as many of the settlers in I-11 were from the Khyber Pakhtunkwa Province, a heavily radicalized area formerly known as North-West Frontier Province along the Afghanistan border. Islamabad’s settlements overall, however, are largely inhabited by Christians, estimated at nearly 80,000. Masih and his family reside in Islamabad’s Maskeen Colony, one of about 30 makeshift settlements to which the CDA has sent eviction notices. Many poor Christians in the settlements find it difficult to find jobs in the city for the sole reason that they are Christian. Masih’s cousin, Aamir, said Christian slum dwellers are often forced to take up menial jobs. Arif Bhatti, another Christian slum dweller, said he was worried sick about how he will provide for his eight-member family should the CDA bulldoze their rusty, one-bedroom home. Pakistan Interfaith League Chairman Sajid Ishaq told Morning Star News that it was lamentable that the government was displaying such religious bigotry toward one of the most marginalized communities in the country. Ishaq said each passing day is grimmer for the nearly 80,000 Christians who have settled in the Islamabad slums over the years in search of better livelihood. No one aspires to live in a slum, he said. “We acknowledge that provision of shelter and the opportunity to earn a decent wage are dependent upon the availability of resources, but the government cannot take away what little means these poor have to survive,” Ishaq said, stressing that the Supreme Court must not allow the CDA to go ahead with a religiously-biased plan to dislodge poor Christians from their homes until the Authority arranges alternative, permanent housing for them. Legally, resettlement has to improve on their original location, Ishaq said. “Only in exceptional circumstances can a removal take place, and that too after a resettlement plan has been drafted and approved through consultation with the residents,” the rights activist told Morning Star News. “The CDA’s reply is proof of the deeply prejudicial mindset that prevails in the CDA with regard to working classes and minorities, whom they regard with utter contempt,” Rashid said. “This sort of anti-people, anti-minority authoritarian attitude has no place in the 21st century and needs to be relegated to the dustbin of dictatorial history that it emerged from. Islamabad as the national capital belongs to all of Pakistan’s citizens, not bureaucrats of the CDA, he said. “It is not katchi abadi residents but the elitist policies of the CDA that have prevented Islamabad from developing into a thriving and inclusive city like most other capitals in the world,” Rashid said. Advocate Abid Hassan Minto, who is arguing the case in the Supreme Court on behalf of the AWP and slum dwellers of various areas, said the government has turned a blind eye to the residents’ increasing need for food, shelter and security, especially in Islamabad. He added that the evictions were not only a violation of fundamental rights but a crime on part of the government. CDA spokesman Ramzan Sajid refused to comment on the Authority’s reply to the court, saying he could not discuss a matter still under judicial consideration, and that the CDA had already stated its response to the slum dwellers’ petition. Morning Star News also tried to reach Tariq Fazal Chaudhry, the Minister In-Charge of Capital Administration, who was unavailable for comment. On Oct. 28, a three-judge bench of the Supreme Court headed by Justice Ejaz Afzal Khan ordered the federation and provinces to submit a concrete plan for providing shelter for homeless people. The judges observed that tangible plans were overdue. “We therefore direct the federation as well as provinces and CDA to give their feedback as to how this serious problem – which, with every passing day, is assuming an alarming proportion – can be solved within a shortest possible span of time,” the bench stated. The court’s order stated that plans that government officials have proposed look captivating on paper but on close examination do not appear to be concrete and feasible. The court emphasized that providing shelter is a fundamental issue that authorities have so far ignored and overlooked, resulting in people making homes wherever they find space. The court then directed the federation, provinces and CDA to find practical plans in line with the constitution.